The Golden Gate Bridge in San Francisco is one of the most visited destinations in the state of California. The “bridge that couldn’t be built,” stands today as one of San Francisco’s most notable landmark. Completed in 1937, after years of fighting howling winds, dense fog, and dangerous waters, the bridge now stands as a testament of will and an icon of the city. The 1.7-mile bridge stretches across the strait of Golden Gate, connecting the San Francisco Presidio to the Marin Headlands. With its enormous 746-foot tall towers, strong cables, Art Deco style, and its notable orange color, the Golden Gate Bridge is the ultimate sensory experience. Pedestrians and cyclists are permitted along the sidewalks of the bridge during daylight hours. There are look-out points on either side with parking available. Don’t have a bike? Rent one and enjoy a self-guided tour by biking across the Golden Gate Bridge. 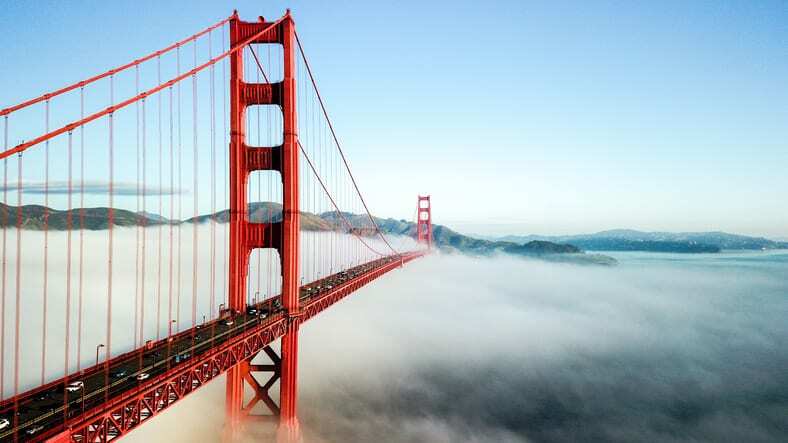 Located five miles from the Golden Gate Hotel, a drive to the Golden Gate Bridge is less than 30 minutes. If you would rather take public transportation, the free downtown PresidiGo Shuttle will take you directly to the Golden Gate Bridge welcome center.